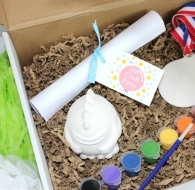 Children love to create, so what better way to spend time with their friends exploring and painting with our paint your own ceramic party boxes. Simply choose which themed box you require and select the amount of children you have attending. 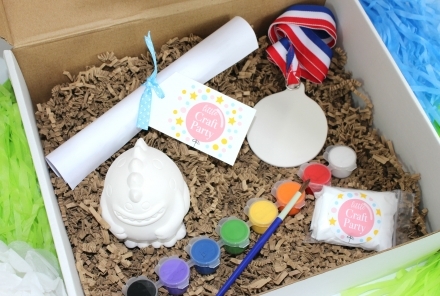 Our craft boxes contain everything in one box for your child and guests to create their masterpieces, so simply place them out where the party will take place and sit back and enjoy. Our craft party bags are the perfect way to end a party, but they can also be used for many other occasions, like entertaining the children during the school holidays or long car journeys. 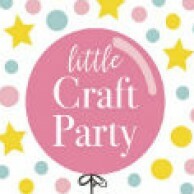 Choose from a range of themes such as Superhero’s, Unicorns, Pirates and many more. The party bag is one of the most important parts of a party to a child, so make sure they go home with a smile on their faces and their parents can enjoy the non-sugar fuelled sweet rush. Your guests can continue their creativity and fun even after the party’s ended.